There is little doubt that the dream of seeing polar bears in their natural habitat is a powerful incentive to travel, however timing and location of such travel is important to maximise the opportunity of sightings. 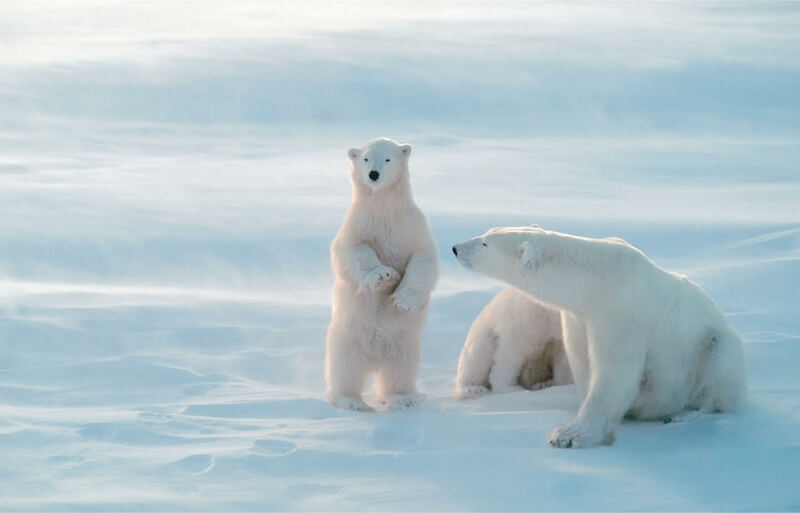 Ponant’s12 night luxury Spitsbergen/Svalbard voyage, Discovery of the King of the Arctic, takes place in prime polar bear viewing time, July, that period when the Midnight Sun doesn’t set below the horizon, and the Arctic ice slowly melts. Then there is less ice than in winter, and the polar bears tend to be in more concentrated areas, on drifting pack ice, from which they can hunt their favourite prey, the ring seal. And be observed. More than 3,000 polar bears live around Svalbard, outnumbering the human population, so the chances of seeing one or more polar bears is high but nature being nature such things are likely although cannot be guaranteed. Fortunately there is plenty of other wildlife to look out for and photograph. Arctic foxes, Arctic terns, walruses, whales, puffins. Svalbard reindeer have no natural predators, so don’t be surprised to see one wandering around, unperturbed, even in colourful downtown Longyearbyen. At 78 deg north Longyearbyen is the northernmost town on Earth, and the extraordinary start and finishing point for this memorable voyage. Less ice also makes it possible to navigate the beautiful Norwegian Svalbard archipelago: magical landscapes, a blend of ancient glaciers, jagged mountains and spectacular fjords, seen from the decks of the compact 264 guest Le Boreal or closer still during Zodiac outings, the summer sun showcasing the grand vastness of this icy realm. Exploration with the specialist team of Naturalists will enhance interaction with nature. In Norway, conservation is an age-old tradition based on sustainable principles established long before anybody had ever heard the term - since set down in law, reflecting a long-term respect for nature and wilderness. Nearly two-thirds of the surface of Svalbard is protected consisting of several nature reserves, national parks, bird sanctuaries and a geotopical protected areas. So too polar expedition specialist PONANT respects the environment. With over 20 years of polar experience PONANT is the world leader in polar voyage expeditions. A member of both IIATO* and AECO* its fleet of ships - the most modern in the world - are all ‘ice certified’, featuring the very latest in maritime technologies and safety. Environmental respect is at the core of PONANT philosophy, with carefully chosen itineraries, the use of coatings that minimise air and water pollution, respect for the local populations, and raising awareness among crew and passengers both on board and prior to landing. Flexibility is key to getting the most from an adventure like this and the ship’s Captain and Naturalists will maximise the daily opportunities afloat and ashore to ensure guests have every opportunity to experience the very best of this 13 day polar voyage. With PONANT there will be no hardship encountered being a modern polar explorer. Instead enjoy French luxury and ambiance on Le Boreal and experience the difference small ship cruising offers. Intimate cruises venturing where large ships simply cannot. Pricing currently from A$14,250 per person, twin share, in a Deluxe Stateroom with private balcony. Please note: all fares are yield managed and PONANT Bonus savings will decrease as space is sold. Price includes Paris/Longyearbyen/Paris flights pre/post voyage. Fare also includes accommodation, all meals on board, Open Bar, 24 hour room service, expedition parka, free boot hire, outings in Zodiacs with the expedition team, onboard presentations. Set sail from the cosmopolitan village of Longyearbyen, - the journey will begin with an exploration of the wild and unspoiled east coast of Spitsbergen before reaching the lush green valleys of Bellsund fjord, followed by a visit to Ny Alesund, the former mining town and the most northerly post office in the world. Further north, the majestic Monaco glacier, an impenetrable wall with blue-tinged highlights. This expedition voyage has been designed for those to whom the essence of travel means being rewarded with rare experiences far from mainstream tourism, sharing the day’s adventures with family, friends or like-minded travellers and the stimulation of mixing with informed, passionate speakers and knowledgeable Naturalists ….. all the while travelling in luxury. As a member of the Association of Arctic Expedition Cruise Operators (AECO), PONANT continues to demonstrate its commitment to supporting and promoting the Arctic zone and to operating cruises to the area which are respectful of the environment and native populations.